I’ve never been much of a spiritual person or religious either. But since moving to Japan for the second time I’ve felt differently. Here there are 2 main religions, Shinto and Buddhism, the first, Shinto, is similar to paganism, worshiping gods that are part of nature – mountains, trees, animals etc. And Buddhism is about the body and soul and gaining enlightenment. These two work hand in hand as they don’t overlap in any areas of their ideals so there isn’t any ‘my god is better than your god’ nonsense. Shinto deals with everyday life whereas Buddhism deals with death & the afterlife. 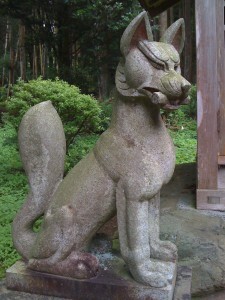 It seems a spiritual place as regards to the Shinto religion, you can’t avoid seeing small shrines dotted about the place to respect local gods, statues of foxes and lions etc. Trees with rope tied round them with paper talismans hanging down. 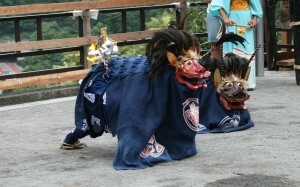 Local festivals with lions, foxes, spirits and deities performing dances. Even the names of places have some spirit connections, a town near where i live is called Ishigamimae, which means ‘In front of the Stone God’ conjures up images of a huge stone golem striding around the forest, squashing wayward hikers. So when people say that someone has committed suicide off a certain bridge and mentions a ghost, or someone has seen a face in a window of an abandoned house, it seems to have a bit more meaning. 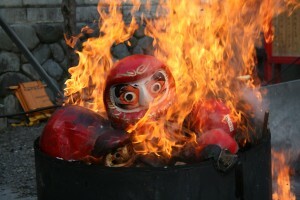 first pic is daruma being burned – to start a project, you paint 1 eye, when the project is finished you paint the other, then burn it at the end of the year for the project to be lasting. second pic is a Japanese lion dance from our shrine. 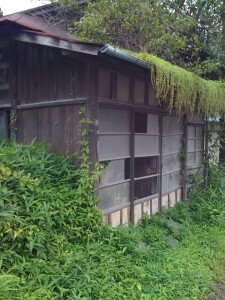 fourth is the mentioned abandoned house near here. My understanding is that Pure Land buddhism is the most popular form in Japan (and not Zen as most people assume). In Japan the Jōdo Shū and Jōdo Shinshū schools are the two main Pure Land schools, whereas outside of Japan the Pure Land is part of the Mahayana Buddhist teaching rather than forming a separate school. In this respect Japanese Buddhism is atypical of general Mahayana Buddhism, and probably reflects the influence of older animistic Shinto beliefs and practices. Rather than co-existing as two separate religions there seems to have been a complex co-evolution.